Link to our 2012 Tobago Blue Food Festival pictures. 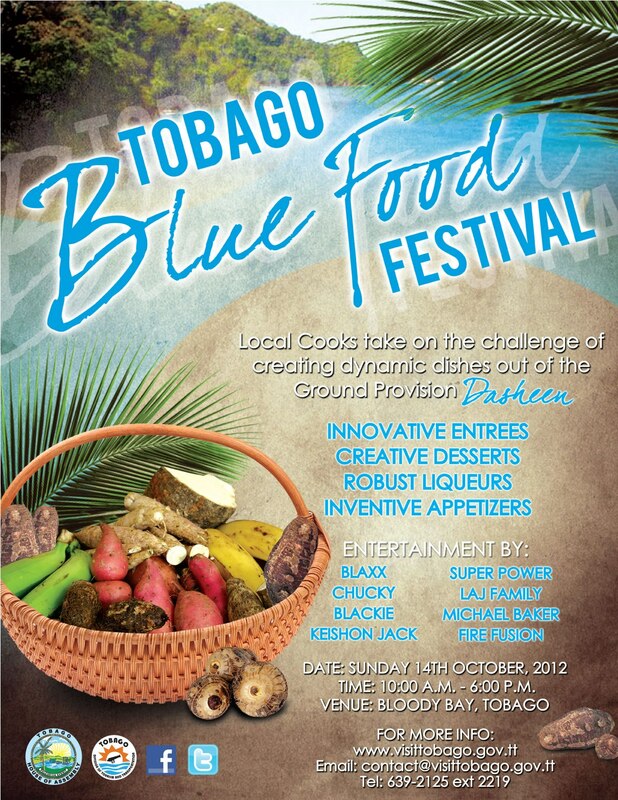 Tobago’s 2012 BLUE FOOD FESTIVAL is Sunday, October 14th! As always, versatile dasheen is the main ingredient as local cooks create appetizers, entrees, desserts, beverages and liqueurs from this superstar provision. Festival patrons can enjoy cooking demonstrations and competitions, samples of chefs’ creations, blue food displays, a crayfish competition, and a petting zoo for children. For the main attraction, 25 cooks from L’Anse Fourmi, Parlatuvier and Bloody Bay will throwdown to create top dasheen eats, including best overall dasheen dish, most creative dasheen dish, best dasheen dessert and best dasheen beverage. There’s also a wide variety of local dishes for purchase and of course, blue food to take home. At last year’s festival, we bought dasheen done three ways – a dasheen punch, wine and kuchela, while chatting with friendly cooks who shared the recipes used to create their dasheen edibles. This dasheen fete is not to be missed. It is truly a testament to how Tobagonians have creatively maximized the culinary possibilities of a humble ground provision. Check out our post on five Tobago restaurants you should try and 5 Picks for Breakfast in Tobago! TIPS: Walk with an umbrella (October is still rainy season); Consider wearing waterproof/mud-friendly shoes; Bring your own chair, if possible; Be prepared to park your car at the village entrance and take a shuttle to the festival location. Live Entertainers: Blaxx, Super Power, Chucky, Laj Family, Blackie, Michael Baker, Keishon Jack and Fire Fusion. Sponsors/Organizers: Tobago House of Assembly’s Division of Tourism & Transportation; Village Councils of L’Anse Fourmi, Bloody Bay and Parlatuvier. Link to Pictures from 2011 BLUE FOOD FESTIVAL. Tags: Blue Food, Tobago Culinary Events, Tobago Culinary Festival. Bookmark the permalink.